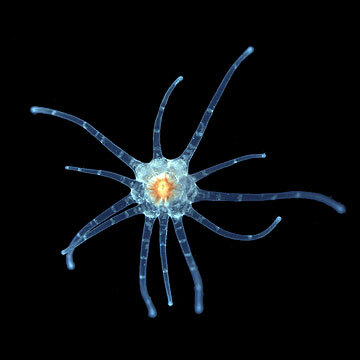 Scientists studying a starlet sea anemone thought that since it's a simple animal it would have a simple genome. The tiny creature fooled them. "The results turned out pretty shocking to us," said Mark Martindale, University of Hawaii professor of organismal biology and director of the Kewalo Marine Laboratory, Pacific Biosciences Research Center. "They contain almost all the genes that human beings have, including disease genes and things like that, even though these animals don't have the kinds of tissues and organs of sophisticated animals like vertebrates." Martindale was part of a team reporting the first analysis of the sea anemone's genome in the journal Science. "We are looking close to the base of the animal tree of life," said the team leader, Daniel Rokhsar, University of California-Berkeley genetics professor and head of the computational genomics program at the Department of Energy's Joint Genome Institute in Walnut Creek, Calif.
"Comparing genomes is a way of looking back in time to infer features of the ancestral genetic blueprint for animals," Rokhsar said in a UC-Berkeley news release. The sea anemone's genome is nearly as complicated as the human genome and "provides major insights into the common ancestor of not only humans and sea anemones, but of nearly all multicelled animals," the scientists reported. Martindale discussed the results in a telephone interview from Woods Hole Marine Biological Laboratory in Massachusetts, where he's teaching an embryology class and doing some research on marine animals in that area. He said he began working on the little starlet sea anemone, Nematostella vectensis, about 12 years ago with John Finnerty, former postdoctoral researcher at the Kewalo Lab. An expert in molecular evolution, Finnerty is now at Boston University and was co-author of the paper in Science. They published what was probably the first paper about an important group of developmental regulatory genes in the animals in 1997, Martindale said. Since then, he said, Kewalo researchers have published more than 25 papers investigating molecular control of the development of the sea anemone. He said it represents "an important and understudied group of animals that are closely related to corals," known as Cnidaria. "We were thinking simple animals would have fewer numbers of genes and be fairly unsophisticated at the molecular level," he said. "It turns out to be not that simple at all. They have roughly the same genes as humans, but they don't have cell types, organs, lung and pancreas, and limbs and brains," Martindale said. "But yet they have all the genes in the genome used to generate those structures in vertebrates." Rokshar said analysis of the genome allowed the team "to compare the sea anemone with other animals and see what the genome of their last common ancestor looked like, even though such creatures have been extinct for 600 to 700 million years." By comparing genomes, he said, it's possible to infer which genes were present in the ancestor and how their chromosomes were structured. Humans have about 20,000 genes and the sea anemone has about 18,000, which the researchers said implies that the common ancestor had about the same number of genes. "Many genes close together in the sea anemone are still close together in humans, even after six or seven hundred million years," said Nicholas Putman of the Joint Genome Institute, lead author of the study. Martindale said research at the Kewalo Marine Laboratory has helped to "completely change the way people think about animal evolution," although the small lab "has not received proper recognition for its international status."